So what is the World Cup of Golf? 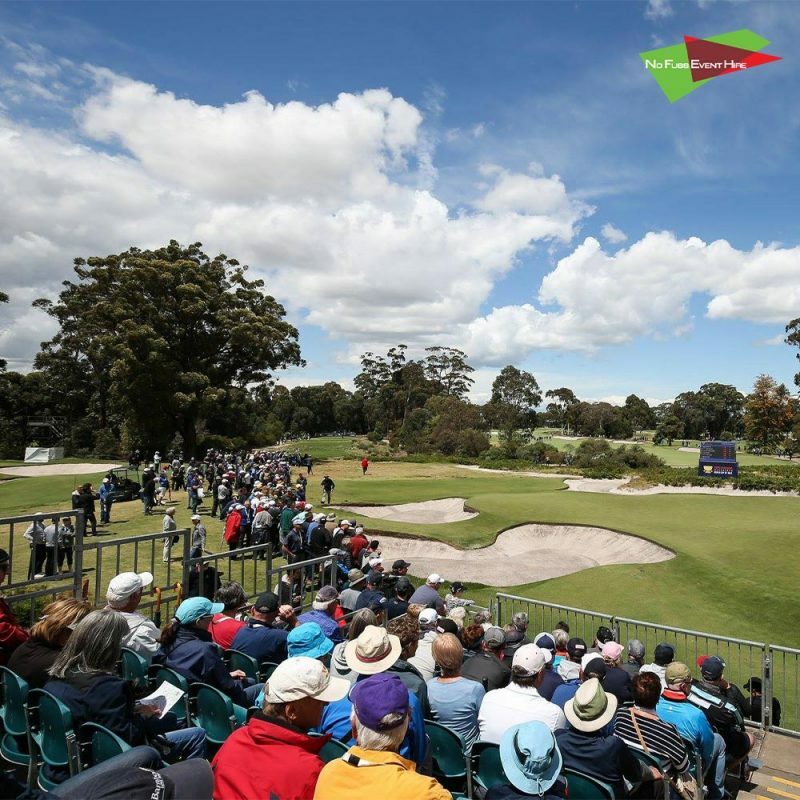 The World cup of Golf is a prestigious tournament played in each year in Melbourne at Metropolitan Golf Club in South Oakleigh. 2018 marked the 59th World Cup. Played as a 72 hole stroke play, 28 nations compete and are chosen from the official world golf ranking. The Belgians took out the tournament for the first time ever, with Thomas Pieters and Thomas Detry taking it out with a score of 265, 23 under par! Australia just missed out, tying for second place with Mexico. 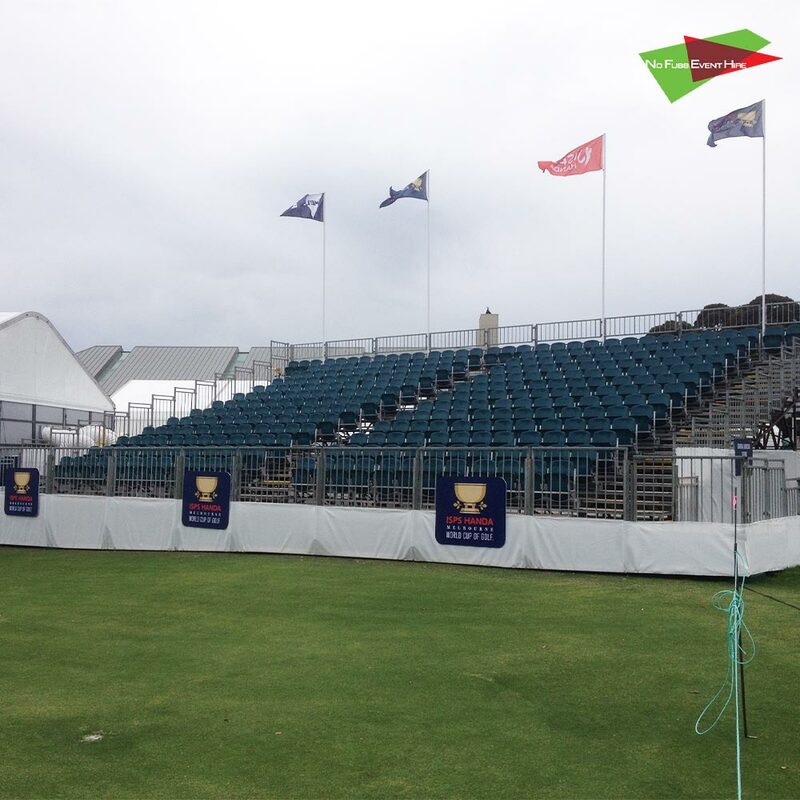 No Fuss Event Hire was charged with the task to design and build six grandstands for patrons to view tournament activities at various locations on the course. A seating configuration of six grandstands to accommodate 1,500 guests was built. 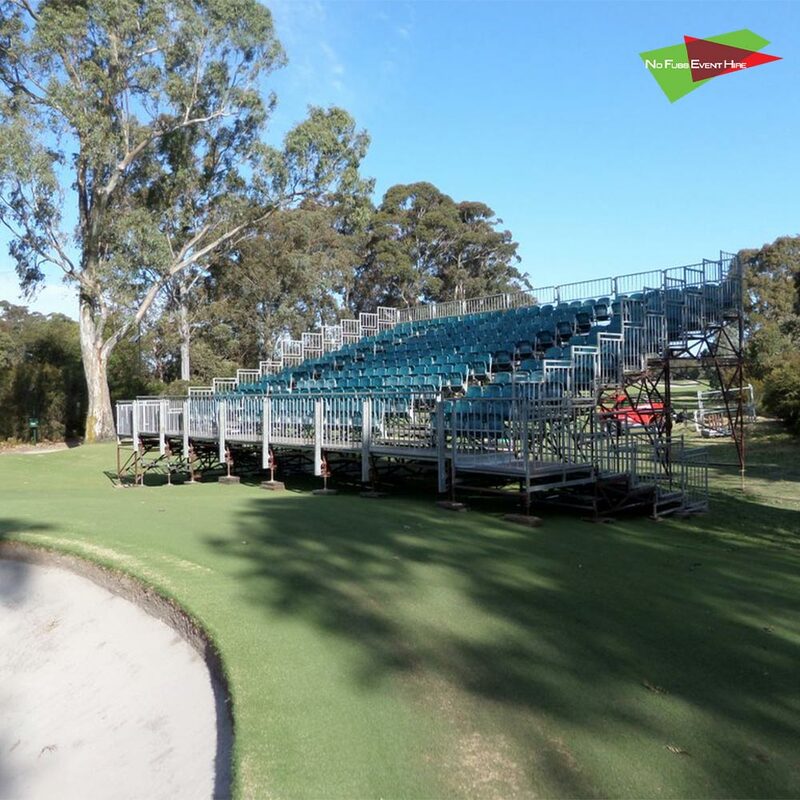 No Fuss Event Hire have an extensive selection of grandstands. Several choices include fixed and demountable grandstands and even event scaffolding! Structures can be provided to facilitate auditoriums, halls, large outdoor stadiums and arenas either indoors or out. Numbers between 300 up to 30,000 can be accommodated. Grandstands for shade and weather protection can be provided. We also stock accessible viewing and camera platforms for officials and broadcasters. In-house engineers ensure your installation is fully compliant with required building codes and structurally certified once installed. Event scaffolding can also be supplied to complement venue infrastructure. This works in conjunction with safety, functionality and presentation. Heavy duty I-Trac roadways and Supamats were required to maintain the integrity of the pristine course. I-Trac temporary portable roadways provide a short term solution for creating heavy vehicle pathways. It is a single component heavy-duty solution for large vehicular access. It enables vehicular traffic to maneuver over the uneven or unsafe ground. I-Trac is a composite interlocking roadway system that is entirely manually deployed. It is secured by an inbuilt connection device that requires no special tools to operate. Each panel has 8 attachment points that enable the user to bolt on accessories where needed. Inert to most chemicals, I-Trac offers a safe level of electrical insulation whilst accommodating loads of up to 200 tonnes per square metre. Supamats (commonly referred to as bog mats or Trakmats) are temporary flooring sheets made from 100% recycled high density 1.27cm thick polyethylene plastic. Cylinders on both sides provide a gripping action in all weather conditions. The open space between cylinders create the necessary pathways to release mud and debris from the traction area. With a normal truck tyre being in contact with at least 36 cylinders at any one time, there is more than sufficient load support and gripping power with this temporary flooring/roadway. All cylinders are paired with an identical cylinder on the reverse providing the traction between mat and ground. Supamats work equally well in sand and snow conditions and are unaffected by heat or cold and can be hired or purchased.